There was another wind warning yesterday. It didn’t amount to much. Sometimes this happens because Mayne Island is often on the edge of a storm as it sits where the swirly marks on the weather report change directions. But after the last storm we need some more butane for the little heater and cooking element. It is always best to be prepared. We are also low on groceries so I venture out – with my camera too of course. When I am done my chores I go to our favourite beach and see what I can see even though there is a light rain, a good wind and visibility ceiling is low. Yike! I don’t think we will be going to sit out on the sandstone rocks today either. Well that is enough of that! The rain is trying to blow into the lens hood and it is not particularly pleasant out here. Time to go make a hot cup of tea and nibble on that fresh Farm Gate Store bran and apricot muffin. I may muse awhile about the packages of seeds and spring plants I saw at the Hardware Store for awhile as well. It seems to be the best sign of spring we have seen for days. Oh, I guess I could work on packaging up the paper work for our taxes too. Hum. Let’s have tea and think about it. Sprout: What seems so near but is far off on your creative horizon? P.S. seems to be some trouble replying directly from email notices today. My apologies. I have checked the settings and everything seems to be in order. Hopefully the issue if fixed soon. But this might help to make you feel at least a little better…. BROWSE THE WHOLE BOOK! For the next 48 hours you can browse my whole book PRECIOUS SECONDS – MAYNE ISLAND IN PAINTINGS AND PHOTOGRAPHS plus I made it available on standard paper lowered the profit to $2.00 from $5.00 over the production price – creating a nice savings if you have had this on you wish list. Things will go back to usual pricing with a 15 page preview on Saturday morning. Make that cup of tea and enjoy! Good Morning Terrill…we are far from home but am enjoying your weather updates. You have some good photos. I have tried to capture ‘the wind’ in photos too and I can be nearly swept off the deck and still not able to convey the fury of the wind. Wishing you all well and safe. Oh Shirley I am glad someone else has experienced how difficult it is to capture the wind in a photograph! We have had some stiff winds but have seen worse many times before. So we are safe and sound though wishing for spring. The daffodils are starting to show up in the field. Soon I shall see what I can do to capture them for you to see as well. Enjoy your time away and look forward to seeing you around the island sometime in the future. Terrill – And while you guys are getting battered by wind and rain, the sun has decided to come out and play nicely with us. In fact, we’ve got all the windows open. Had we done that last week, we’d have frozen our buns off! Well enjoy that fine weather while you have Laurie. Nothing like the first few days of having the windows open. I did that here a few days back not because it was nice but because I was chasing winter out… almost blew David out from the momentum of his chattering teeth in the process but it was worth it. Happy musing. Another good blow – that’s quite a few now in 2011. This one tore the cap off our stove pipe, or more likely finished a job started by the other storms. 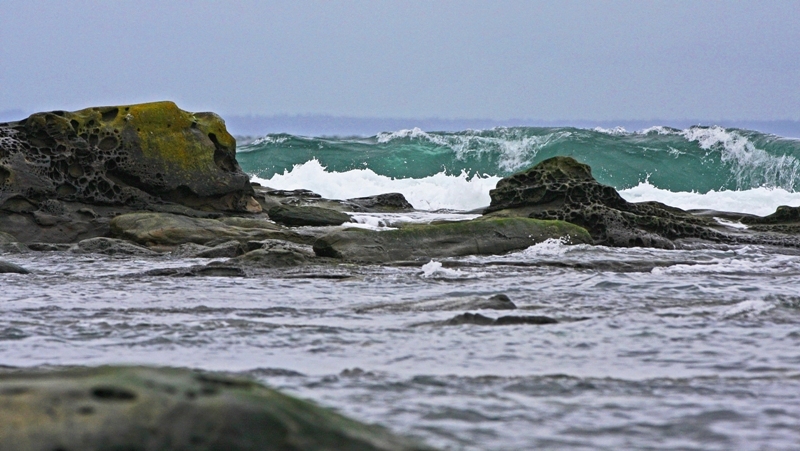 I like these shots – especially the colour of the water and the grey surface of the waves. Yes I am assuming you had it in Victoria as well. I really enjoyed browsing your blog “Burnt Embers” today. Do you have your eye on one of the new Mark 5D III camera bodies? I only have a EOS 40D right now and have it in mind to upgrade. But yikes a person will have to sell a lot of photographs to recover this investment! I should have said 2012 in my original comment. We generally share your weather, though sometimes you are just far enough north to get something that we miss. Thanks for you comment on my blog. I have quite a few storm pictures from this winter, but they really are hard to depict. As to the 5Diii – I really know nothing about it. The 5Dii is more camera than I am accustomed to, and I still have a great deal to learn about how to use it. And, they are very expensive, especially for recreational users like me – I will be paying it off for some time to come. But, it gets lots of use, has got some artistic strands back into my life, and is also used a lot by a couple of my childrren for their projects (it does amazing video). I have had two regular conversationalist who wanted to comment on today’s post say they couldn’t because they were not logged in even though they knew they were. I have no idea what might be the problem and have double checked all the settings and there shouldn’t be an issue. My apologies for the inconvenience and I hope the issue is fixed soon. BROWSE THE WHOLE BOOK! For the next 48 hours you can browse my whole book PRECIOUS SECONDS – MAYNE ISLAND IN PAINTINGS AND PHOTOGRAPHS at Plus I made it available on standard paper lowered the profit to $2.00 from $5.00 over the production price – creating a nice savings if you have had this on you wish list. Things will go back to usual pricing with a 15 page preview on Saturday morning. Make that cup of tea and enjoy! Your pictures are wonderful but do make one think of hot tea….I think muffins are off my list for awhile. Thanks Alison. You comment made it in but I had to approve it. Still trying to see if I can post a comment. I did find out what’s going on, via Kathy who posts here. It seems it is a “thing” w/wordpress. . .the masses are storming the gates to get this “thing” put out to sea (perhaps in some on those awesome BIG waves you show here) as soon as possible. “And then there was weeping & gnashing of teeth”… VERY INFORMATIVE regarding who is able to post comments on word press blogs now. Oh my thanks Alision! Thanks Kathy! I shall go over and have a look. This one had to be approved as well but hopefully this will be the last of it. It seems that what WordPress has done is if they recognise your email address (rightly or wrongly) as being associated with a wordpress account, then you need to log in to your account in order to post a comment. Or, you can use a different email address to comment without logging in, if you have one. If you do that, then your comments have to be approved, at least the first time. It explains why I have been seeing regular commenters coming to my blog using new email addresses and solves a small mystery for me. Well Ehpem this does explain a few things for sure. Oh well, thankfully readers are of the attitude – where there is a will there is a way and seem to be able to get around just as you have explained in your comment. So annoying though! I just experimented by trying to comment on a blog using an email that used to be associated with my WP site. It would not let me until I logged in, even though I deleted that email and replaced it months ago in my personal settings. Once I logged in, it allowed me to comment with a name and the old email address without using or showing my blog identity. Many thanks Ehpem, really appreciate you sharing all this info. And I just tried to post again and have to LOG in – I guess I will need to do that every time I want to post a comment to any WP blog?? Well Terrill, I must say that the weather in these parts has been cooperating. We’ve had some balmy days, and for the most part we’ve been treated to 70 degree days at a time of the year where such warm readings are mighty rare. In a sense though, you have what is more appropriate to this time, and a more honest transcription of March, that raw and most unpredictable of months. As always your atmospheric photos bring Mayne Island to the reader. I can’t seem to get the movie comedies project underway, even with plans that were hatched many months ago. It will take more determination and some new ideas. Ah well. Have a great week my friend! You too Sam. I am mostly off line this week with some time being spent with my oldest grandson. But next week should see us back to normal.